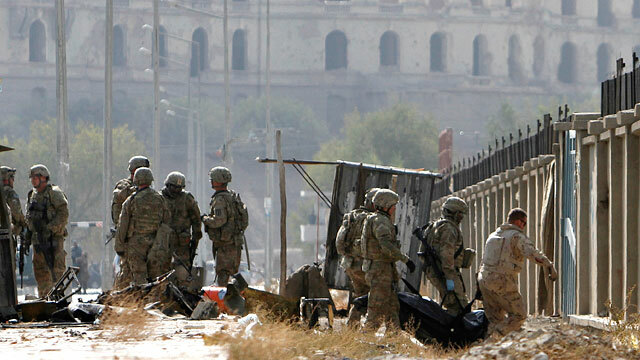 US soliders, right, carry a body from the site of a suicide car bomber in Kabul, Afghanistan, Saturday, Oct. 29, 2011. At least five NATO service members and eight civilian contractors, many believed to be American, were killed in Kabul today when a land cruiser with 1,500 pounds of explosives blew up next to an armored U.S. bus -- the deadliest attack on U.S. troops in the Afghan capital in 10 years of war. Two Afghan students, an Afghan National police officer and another civilian on motorcycle were also killed. The suicide bomber was waiting for the Rhino bus, which was on its way to deliver the troops to a NATO base in Kabul, according to U.S. officials. The attack was the sixth major assault in Kabul in the last six months, a worrying spike in violence that shows insurgents have transformed their campaign of rural intimidation into one of urban violence, especially in and around Kabul. Abdul Rahman Hazarboz was driving the car, according to a Taliban statement sent to reporters, and targeted a bus carrying U.S. trainers of the Afghan police. U.S. officials often say that these types of attacks are a sign of "desperation" by Taliban insurgents who are unable to launch frontal assaults against U.S. troops. And the U.S. has found some success in southern Afghanistan, where in the last year, troops have flooded in and security in much of Kandahar and Helmand has improved. But the United Nations says across Afghanistan, violence against both Afghans and the U.S. is up by 40 percent this year. And since the spring, insurgents have managed to execute some of their most high profile attacks of the war in Kabul. Last month, former Afghan president Burhanuddin Rabbani was assassinated in his home, which is next to the U.S. embassy. The week before that, insurgents launched an assault on the seat of Western power in Kabul: NATO headquarters and the U.S. embassy. Insurgents held out in one of the most secure parts of the country for 20 hours, launching rockets that injured at least six troops. In August, insurgents killed 30 U.S. special operations troops 40 miles from the capital and besieged a British cultural building in Kabul. And In June, nine insurgents stormed the Intercontinental hotel, the capital's most famous landmark. In each of those attacks, U.S. officials blame the Haqqani network, an insurgent group independent of but allied with the Taliban based in Pakistan's tribal region. U.S. officials have authorized peace talks with Haqqani militants, but U.S. military officials say they have, at the same time, increased the number of operations against the Haqqani network along inside Afghanistan, along the border with Pakistan. The U.S. continued to argue today that security in Afghanistan has increased, and that the Taliban were on the run. "The enemies of peace are not martyrs, but murderers," said the top U.S. commander in Afghanistan, Gen. John Allen. "To hide the fact that they are losing territory, support, and the will to fight, our common enemy continues to employ suicide attackers to kill innocent Afghan fathers, mothers, sons and daughters, as well as the Coalition forces who have volunteered to protect them." Rhinos use state of the art armor and were used extensively in Iraq to shuttle vips – including Saddam Hussein after he was captured -- along the then-dangerous airport road. They are built with a v-shaped bottom to deflect blasts from roadside bombs, but the armor was no match for a suicide bomb that, according to a statement from the Taliban, was as large as any bomb seen in the capital. In May 2009, the Taliban claimed a similar size bomb was used to kill 4 serving colonels in the same area of Kabul as today's attack. During today's attack, at least two medivac helicopters landed at the scene and evacuated some of the wounded. In addition to this attack, a young female suicide bomber on foot attacked government offices in eastern Asadabad city, killing herself and wounding at least four. In another separate attack in southern Afghanistan, at least three Australian NATO soldiers were killed after an Afghan soldier they had been training with turned his gun on them. In 2011, there have been at least 12 cases of Afghan forces turning their guns on their foreign mentors; there were only 13 such cases between 2005 and 2010, according to a tally by the Washington think tank Brookings.